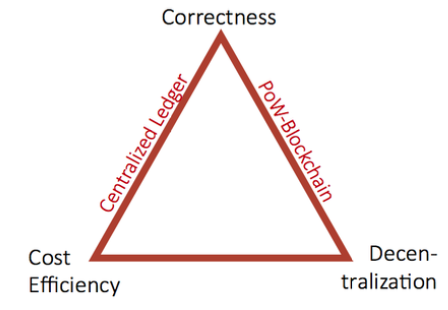 The blockchain trilemma highlights the key economic trade-offs in designing a ledger. Traditional ledgers, managed by a single entity, forgo the desired feature of decentralisation. A centralised ledger writer is incentivised to report honestly because he does not wish to jeopardise his future profits and franchise value. Blockchains can eliminate the rents extracted by centralised intermediaries through two types of competition: free entry of writers and fork competition. Decentralisation comes at the cost of efficiency, however. Free entry completely erodes writers' future profits and franchise values. The ledger's correctness must rely on the purely static incentives provided by proof of work. Fork competition facilitates competition between ledgers but can lead to instability and produce too many ledgers. Furthermore, the ideal of decentralisation may be unattainable when substantial legal enforcement by the government is necessary ... for the blockchain to function properly. Finally, we informally make the important point that while blockchains guarantee transfers of ownership, some sort of enforcement is required to ensure transfers of possession. When banks were fraudulently transferring ownership by foreclosing on mortgages by robosigning, they had to get the assistance of sheriffs to obtain possession. The problem with MERS, the record-keeping system that enabled the frauds, was not that it was centralized, but that it was subject to "garbage in, garbage out". The first thing to note is that, as Eric Budish has shown in The Economic Limits Of Bitcoin And The Blockchain, the high cost of adding a block to a chain is not an unfortunate side-effect, it is essential to maintaining the correctness of the chain, and limits the value of the largest transaction it is safe to allow into the chain. This supports BA's analysis that if the system is decentralized and correct it must be inefficient. Miners of successful blockchains in the real world, such as Bitcoin's and Ethereum's, are not independent; they collude in a few large mining pools to achieve reasonably smooth income. The two largest Bitcoin pools are apparently both controlled by Bitmain. They only have to collude with one other pool to mount a 51% attack. Miners of less successful blockchains may be independent but they are not abundant. The availability of mining-as-a-service means 51% attacks on these chains are becoming endemic. In practice decentralized and secure is not an achievable goal. The security of a successful blockchain rests on the reluctance of the dominant pools to kill the goose that lays the golden eggs. Or, to put it another way, far from being trustless, users of a successful blockchain must trust the humans controlling the dominant pools. Not to mention the core developers. The division between tangible, knowable core code, considered as internal to the Bitcoin ecosystem, and the disruptive actions of actors outside of what constitutes the core allows for the network to maintain its narrative of algorithmic decentralization when facing contradictory evidence. Why do users continue to trust in code, especially in this particular code, in the face of such breakdowns? the collapse of users and their representations on the network into the aggregation of CPUs that power the network. This ambiguity with regards to the identity of the Bitcoin community — individual human actors or their dedicated machines — allows the network to be portrayed as a self-regulating system not susceptible to human foibles, and simultaneously as an enabler of direct action. Under the edict of ‘one-CPU-one-vote,’ any incident within the Bitcoin network is at once the expected result of running the protocol and the enforcement of an expressed consensus of its users. The Bitcoin protocol reimagines its constituency as amass of CPUs. the assumption of rational, self-interested agents. When CPUs as stand-ins for a mass of individual users appeared to have been accumulated at the hands of a single actor such as GHash.IO, both the pool operators and the core developers issued statements to reassure users that it would not be in the pool’s rational self-interest to undermine the network or to go over the 51 percent threshold. ... Developers did not hesitate to predict what the pools would or would not do based on rational choice, even though the original developer had failed to predict the (rational) emergence of pools in the first place. 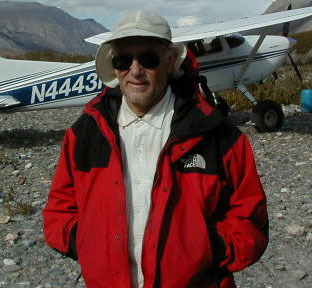 The belief that cryptographic know-how should grant particular actors in the network governing power enables the simultaneous elevation of Nakamoto’s paper as the ultimate authority of keeping the network within the bounds of its intended purpose, and the acceptance of the Core Development Team as the legitimate body to carry out updates of the code. A commitment to technocratic order first enrolls users in the network through the promise of a decentralized system that ensures the need to trust no-one, and then, when the system’s unsettled and unpredictable nature becomes visible, the technocratic order privileges certain actors as legitimate holders of centralized power until the infrastructure can be stabilized again. Collapsing the difference between users and CPUs further facilitates this technocratic structure, because if the Bitcoin network is composed of machines, then who better to rule it than engineers. The fourth and final discursive strategy is casting problems as temporary bugs that will not be present in the final, ideal version of the code. Instead of critically reflecting on the shortcomings of the ‘trust in code’ narrative, participants are asked to ignore contradictions as limitations of a particular implementation of the code. Sites of centralized power are cast not as inherent consequences of the architecture, as features of it, but rather as temporary shortcomings to be overcome in later iterations of the code, as bugs to be patched. Bitcoin’s and blockchain’s initial appeal comes from the promise of a one-time buy-in into infallible code, which will be from that moment on fixed, knowable, and autonomous. Once issues of centralization emerge, however, the code then becomes a malleable experiment, subject to iterations and improvements to address the temporary aberration. If anything is maintained as fixed, it is the belief that trustlessness can be engineered, the belief that Nakamoto’s elegant vision is almost within reach through minor technical adjustments. Participants are asked to trust if not this version of the code, then the next one, in perpetuity. It is of no consequence whether solutions are in sight today, because the peer production model will keep iterating until they are. Thus as problems appear, such as the uselessness of Bitcoin for actual transactions, fixes such as the Lighting Network are layered on top of the inadequate underlying technology. And when problems are found in the Lightning Network, such as the difficulty of routing leading to the emergence of centralized "banks", another layer will be created. Layering can be an independent activity, whereas fixing the underlying technology involves obtaining consensus from its governance structure. The history of Bitcoin's blocksize shows how difficult this can be. "There’s a reason, after all, why bitcoin has attracted so many scammers: All its transactions are irreversible. That’s the price of getting rid of intermediaries, like credit card companies that make sure you’re not getting defrauded. All of which is to say that if you steal a bitcoin, you get to keep a bitcoin. That might be the top use case. Bitcoiners think all of this is worth it. That it’s better to have a financial system that is clunkier, costlier and more vulnerable to attacks than it is to have to trust someone — or, more accurately, to admit that you have to trust someone. Bitcoin exchanges require some measure of it whether they realize it or not." from Matt O'Brien's Bitcoin is still a total disaster. Check out his graph of BTC's wild gyrations between inflation and deflation! Visions of Bitcoin by Hasufly and Nic Carter is an amusing history of the way that in turn, as each idea of what Bitcoin was for proved impractical, a new idea of what it was for took its place. "There is no crime in this promotion, the worst that could happen is someone would try to sue, but who do you think would make a lawsuit for .5 eth or whatever? So knowing this, it is open season for all to get paid." "There's a security economics story here: if a scammer can make millions every month by probing and bypassing Twitter's bot-detection system, they will be powerfully motivated to do so, and can throw a lot of resources at the problem. If Twitter's assumption is that botmasters are petty grifters, astroturfers, and griefers who have much smaller financial stakes, then the measures they develop are unlikely to prevent such a motivated adversary." It looks nearly identical to the CAP (or Brewer's) Theorem that deals with other distributed systems. You can have two of any of the following: Consistency, Availability, or Partition Tolerance. Vitalik Buterin has a 75-tweet storm recounting the history of Casper, Ethereum's Proof of Stake system, and announcing that it will go live August 30. Given the centralizing nature of Proof of Stake, Ethereum has chosen correctness and efficiency as the two out of three. Which is fine for the HODL-ers making the decisions. The world will get efficient if bug-ridden Ponzi scheme bots. "an estimate of around 5 gigawatts for Bitcoin mining alone today. This is slightly under 1% of world electricity consumption, or slightly more than the electricity consumption of the state of Ohio or that of the state of New York. Other public blockchains also consume a substantial, albeit much lower, amount of energy"
"that when you’ve got a computer racing with all its might to earn a free Bitcoin, it’s going to be running hot as hell, which means you’re probably using even more electricity to keep the computer cool so it doesn’t die and/or burn down your entire mining center, which probably makes the overall cost associated with mining even higher." "Altogether, these five networks alone likely consume electricity and other resources at an equivalent scale as The Netherlands especially once you begin to account for the huge e-waste generated by the discarded single-use ASICs, the components of which each required electricity and other resources to manufacture. Perhaps even higher when costs of land, labor, on-going maintenance, transportation and other inputs are accounted for." "The Netherlands has the 18th largest economy in the world, generating $825 billion per annum." Based on a recent analysis from Chainalysis, it found that Bitcoin – which is just one of many proof-of-work coins – handled about $70 million in payments processed for the month of June. Yet its cost-per-transaction (~$50) is higher than at any point prior to November 2017." Extrapolating, that would be $840M in payments, or about 0.1% of the Netherlands GDP. Hat tip to David Gerard. "On Tuesday, the developers of Bitcoin Core—the software that effectively powers the Bitcoin blockchain—released a new version that patched a vulnerability that allowed a malicious user to crash the network, making everyone’s digital coins effectively useless." "the bug was not in the Bitcoin protocol itself but in its most popular software implementation. Some cryptocurrencies built using Bitcoin Core’s code were also affected"